In the normal case, PaperCut NG/MF must identify the user responsible for each print job so that jobs are correctly tracked and charged. However, for ad-hoc guest printing by visitors, it is often more important to provide a convenient printing solution than to provide individual print tracking per visitor. In addition, visitors and guests often want to print from their BYO mobile devices so a generic, widely available printing solution is required. For these scenario's, PaperCut NG/MF provides the ability for guest users to print anonymously using Email to Print. This solution provides a simple and convenient printing experience from any device, imposing minimal or no administrative inconvenience on the guest user as there is no need to set up accounts or network access for the guest. Guests can send their job directly to the anonymous email defined for a physical printer. This is the most convenient way to provide printing access for guests or visitors. Guest users send their job to the printer’s anonymous email address where they are held in a hold/release queue. Jobs are released by the receptionist or a trusted person in the organization. Jobs sent by different guests are identified by the guest’s email address, which is appended to the document name. Guest users send their job to the printer’s anonymous email address where they are held in a hold/release queue. Guests are provided with a common username and password by which they can log in to the MFD to release their job. Jobs are identified by their email address appended to the document name. The starting point for all three anonymous printingAnonymous printing provides the ability for guest users to print anonymously using Email to Print. Anonymous email printing can be implemented in three ways: 1. Direct Print—Guests can send their job directly to the anonymous email defined for a physical printer. This is the most convenient way to provide printing access for guests or visitors. 2. Managed Release—Guest users send their job to the printer’s anonymous email address where it is held in a hold/release queue. Jobs are released by the receptionist or a trusted person in the organization. Jobs sent by different guests are identified by the guest’s email address, which is appended to the document name. 3. 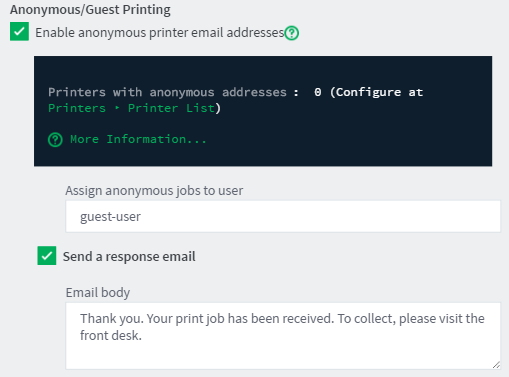 Guest Self-Release—Guest users send their job to the printer’s anonymous email address where it is held in a hold/release queue. Guests are provided with a common username and password to log in to the MFD and release their job. Jobs are identified by their email address appended to the document name. modes is the Options > Mobile & BYOD page. Email to Print must be enabled and configured. If you have not yet set up Email to Print, do that first (see Email to Print), then return to this section. Select Options > Mobile & BYOD. The Mobile & BYOD page is displayed. In the Email to Print area, select the Enable anonymous printer email addresses check box. Optionally change the user to which anonymous jobs will be logged. The default user is guest-user. If you want guests to receive a reply email in response to sending a print job, select the Send a response email check box. You can customize the email body as required. Create the user beforehand in AD/LDAPThe Lightweight Directory Access Protocol (LDAP) is a directory service protocol that runs on a layer above the TCP/IP stack. It provides a mechanism used to connect to, search, and modify Internet directories. The LDAP directory service is based on a client-server model. as a regular user and sync it with PaperCut. user in the same way as any other user. Ensure the user is configured as unrestricted. or Enable internal users in Options > User/Group Sync. If internal users are not enabled, you can still use the internal guest user to log jobs, but you cannot log in to this user. Enable a printer for anonymous printing by configuring an anonymous printing email alias. In the Email to Print area, add a valid email address or alias in the Anonymous email address text box. Ensure your printer does not have Enable hold/release queue checked in the Printer Details page. You are now ready to test. Email to Print jobs sent to the printer's guest email alias print without intervention. When using direct print, consider implementing a print script to force printing policy. For example, converting jobs to duplex, or redirecting large jobs to a high volume printer. Configure your printer to use a hold/release queue. In the Hold/Release Queue Settings area, select the Enable hold/release queue check box. This ensures that jobs are held in the print queueA print queue displays information about documents that are waiting to be printed, such as the printing status, document owner, and number of pages to print. You can use the print queue to view, pause, resume, restart, and cancel print jobs. until users are ready to release their jobs. Make the receptionist or person responsible for releasing guest jobs a delegated release manager for the guest user. In the Advanced Options area, select the: Allow this user to release jobs printed by others (Delegated print release) check box. Add your configured guest user (default guest-user) to the list of Users; then click Apply. The receptionist can now log in to a Release StationPrint Release Stations place a print job on hold and allow users to release it when required. Often a Release Station is a dedicated PC terminal located next to the printers, however, Release Stations can take other forms such as a web browser based interface. Some common examples where Release Stations can be used include secure printing, approved printing, and authentication. In a secure printing environment jobs are only printed when the user arrives at the print area and confirms his or her identity. This ensures the user is there to collect the job and other users can't "accidentally" collect the document. In some organizations it may be appropriate to hold jobs until they are approved by selected individuals. A good example would be a teacher approving printing on an expensive color printer. Hold/Release queues can be used as a form of authentication in an unauthenticated environment. Users must authenticate prior to releasing their jobs allowing PaperCut NG/MF to confirm their identity. or MFD and see the guest print jobs. Anonymous Email to Print jobs are identified by the source email address appended to the document name. If using swipe cards, reception can swipe their card to log in and release jobs. Check Enable hold/release queue in the Printer Details page. User Release is the correct option for most scenarios. Set a password for the configured guest user (default guest-user). Change this password regularly - e.g. daily or weekly. You can edit the response email to include the guest username and password - or you can direct the user to ask reception for this information. Keep the guest password secure to avoid abuse of the guest printing facility. Run regular reports of printing by your guest user to audit usage of guest printing. Change the guest user password regularly. You can automate this using server-command. The anonymous printing feature is designed for ad-hoc use by guests and visitors. It should not be used by people within your organization, as printing is not tracked by user and many important features such as account selection, script popups etc are not supported. If an Email to Print job is sent to an anonymous printer email address by a known user (i.e. the source email matches a user in the PaperCut database), the job is not logged to the guest-user account. Instead, the normal print workflow for the known user is performed and the job logged against that user.